Out of those 30+ rounds, only 6 were on courses I had played before. A wise man I played with at Lookout Mountain mentioned that just knowing a course can save 4-5 strokes. I agree, which is why it’s my fake excuse #1. I did get brand new irons and a new 3-wood, which took a few rounds to get adjusted to. But I do love those Cleveland TA7’s and the Taylor Made Rocketballz. I was hungover during 1 or 2 rounds, possibly. I’m pretty sure the holes at the Stadium Course in La Quinta were smaller than the specified 4-1/4″. Yeah, that’s it. Raising a puppy is exhausting. According to the Chineze Zodiac calendar, it was the Year of the Dragon. 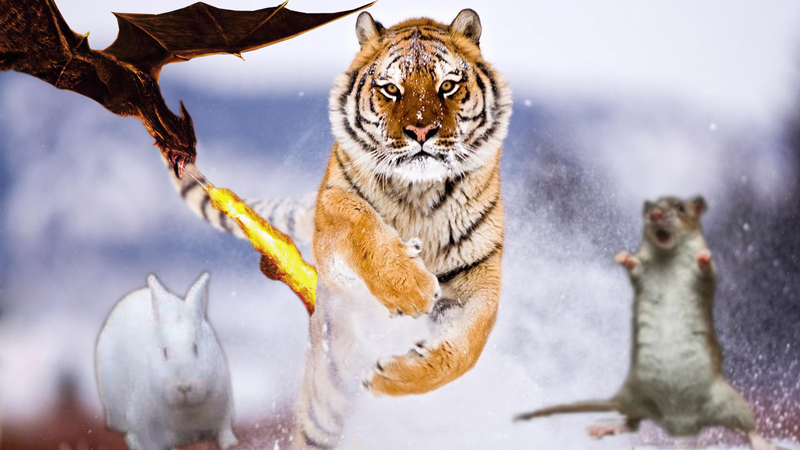 We Tigers don’t play our best golf during years of the Dragon, Rat or Rabbit. So sayeth ancient Chinese folklore (see author’s illustration below). What about 2013 then? I still expect it to contain the required 20+ rounds of desert golf as I remain a resident of Arizona. But I still need 5 new states. I’ve got a few ideas and what my odds are of actually getting there. The question isn’t if I’ll be playing in Colorado this year, it’s how many rounds. I’m thinking 4, maybe 5. As of this typing I can already say 8 guys are confirmed for the 2nd Annual Hacktus Open Invitational taking place in Breckenridge this year. The tournament this year is scheduled to take place in late July at Breckenridge Golf Club, Beaver Creek Golf Club and Vail Golf Club and I can tell you with 100% confidence that everyone is amped for this one. I haven’t seen a dozen guys get so excited about something since the last time my beer league hockey team won a game, which we also do annually. While I’m in the giant square state I also have a strong urge to play the Broadmoor Golf Club in Colorado Springs and possibly, if there’s time, Arrowhead Golf Club in Littleton. Considering my ultimate goal is to live in the Denver area one day, it’s safe to say I’m stoked for July to roll around. It’s right next door! The Land of Enchantment is just an 8-hour drive or 1-hour flight into Albuquerque. Two affordable top-100 golf courses are within an hour of each other near Santa Fe. Word of mouth and just my own desire to get out to the red cliffs of New Mexico make this trip highly likely. And when I get out there, I will absolutely be playing both the Paa-Ko Ridge Golf Club in Sandia Park and Black Mesa Golf Club in Espanola. Seeing some Pueblo ruins would be an added bonus while I’m out there, since I did write a big scene in my book in that location despite having never actually been to a site. The only time I have been to New Mexico was a quick stop during a heavy thunderstorm to see the Albuquerque Isotopes on the ’06 Baseball Trip. Actually, now I seem to remember that game got rained out after flash flooding and my buddy Josh coining the term “cemetery juice”. Guess I’ll take in a game while I’m out there, too. I don’t know when I’ll go, but whenever I can find a solid deal on Southwest during the baseball season and a travel buddy, I’m there for a fun weekend. I may or may not visit Massachusetts for some Freedom Trail exploring and to catch a game at Fenway Park (which will be even more fun with the Red Sox being terrible right now). But I don’t have a clue which course to play. I really, really want to get out at TPC Boston. I love watching the Deutsche Bank Championship every year and the course is playable in the Tiger Woods video game. But it’s a private track and I’ll have to remain outside the gates. I’d have to pick somewhere relatively close to Boston, so a spot like Taconic Golf Club in Williamstown or Red Tail Golf Club in Devens might be too far. As of now I would say Granite Links Golf Club in Quincy is my best shot at getting out in Massachusetts while not straying too far from Beantown. I don’t think I’ll be disappointed. The pictures look awesome with the Boston skyline off on the horizon, though it may be a bit out of my price range. If Nicholas and I can get in sync and out to South Carolina this year, it will for sure include a round at Harbour Town Golf Links on Hilton Head Island. Aside from the obvious places like Pebble Beach and TPC Sawgrass, I dream about playing this beautiful layout on the shores of South Carolina most. My quest just won’t feel complete until I’ve got a framed photo of me taking a swing with that famed lighthouse in the background. I’d consider the Ocean Course at Kiawah, but after watching the hell the pros went through at the PGA Championship and from what I’ve heard about the extreme difficulty, maybe I’ll save myself the suffering. Staying within the area, Heron Point by Pete Dye looks fun as well, and is part of the same resort as Harbour Town. Sounds good to me. After Harbour Town, the next course I’ve been dying to play is Chambers Bay in Tacoma. I must think about it at least once a week. It gets nothing but glowing reviews, is the site of the 2015 U.S. Open and I would absolutely enjoy a walk on a true links course with the scenic Puget Sound serving as a backdrop. Not to mention they also offer “The Championship Experience,” which for a very reasonable rate includes a round at Gold Mountain in Bremerton (a former host of the U.S. Junior Amateur) and The Home Course in DuPont (which has helped with the U.S. Amateur). That USGA stamp of approval says it all and clearly the Northwest may well be an affordable alternative to the historic courses in the United Kingdom. Plus a visit to SAFECO Field would be a must, as it is still one of the top ballparks to see a game in Major League Baseball today. If I can convince Landon and CJ to make a weekend trip, I’ll be all over the Old Works Golf Club in Anaconda before heading out for some backwoods shenanigans. If South Carolina doesn’t work in 2013, I’ll have to drag Nicholas out to Mississippi for a round at Fallen Oak Golf Club in Saucier. This idea just came to me yesterday, but I like it. If not for this year, then certainly in 2014. The only reservations I have about it would be convincing someone to come along for a road trip through flyover country. I know a person who will go, but she’s far from a golfer. I could take my chances and catch on as a fourth with random groups at each course, but that could end poorly. I did have luck going out as single in Tennessee and at La Quinta this year, though. Here’s how this hypothetical trip would work over 4-5 days. Fly into Wichita and get a rental car. From the Wichita airport to the tarmac in Bismarck would bring this trip to about 1,115 miles, but a reasonably priced rental car would only cost about $130 for just 1 person. Kansas: Sand Creek Station Golf Course in Newton, 35 miles north of the airport. Nebraska: Wild Horse Golf Club in Gothenburg, 358 miles from Sand Creek. South Dakota: Meadowbrook Golf Course in Rapid City, 383 miles from Wild Horse, and just 40 miles from Deadwood! North Dakota: Hawktree Golf Club in Bismarck, 332 miles from Meadowbrook, and then off to the airport. It doesn’t sound so bad when laid out step by step. Each stop comes after a 6- or 7-hour drive of about 350 miles and I can take out a huge chunk of the map in less than a week. This one may never get past the planning stages, sadly. So there you have it, my early estimates on where I’ll be headed this year. My most likely stops would dot the major regions of the country, with one each in the Northwest, Northeast, Southeast and the Rockies. I also like the thought of sweeping my way eastward from the Pacific. Toss in Idaho and Oregon with Montana and Washington and suddenly the green on my map starts creeping eastward like some kind of reverse Manifest Destiny. Arizona: I really want to do the two world class courses at We-Ko-Pa this year and possibly finally get out at TPC Scottsdale. Nevada: I’ll be here for work for a week so if I can sneak out hopefully I can get back out to Paiute or even way up to Wolf Creek finally.